When Rachel was taken to live in a tower by a woman she calls Mama, she was excited. She felt like a princess in a castle. But many years later, Rachel knows her palace is really a prison, and begins to plan her escape. She is encouraged by the speed that her golden hair has been growing. It’s gotten long enough to reach the ground. And she’s begun dreaming of a green-eyed man. Could he be out there in the world? Is he coming to save her? Or will she find a way to save herself? Alex Flinn loves fairy tales and is the author of the #1 New York Times bestselling Beastly, a spin on Beauty and the Beast that was named a VOYA Editor's Choice and an ALA Quick Pick for Reluctant Readers. Beastly is now a major motion picture starring Vanessa Hudgens. 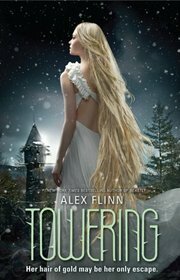 Alex also wrote A Kiss in Time, a modern retelling of Sleeping Beauty; Cloaked, a humorous fairy-tale mash-up; and Bewitching, a reimagining of fairy-tale favorites, including Hansel and Gretel, Cinderella, The Princess and the Pea, and The Little Mermaid, all told by Kendra—the witch from Beastly. Her other books for teens include Breathing Underwater, Breaking Point, Nothing to Lose, Fade to Black, and Diva. She lives in Miami with her family. Rachel's first few years were normal and then the woman she has called Mama takes her to a new home, where she is locked high into a tower. Rachel adjusts to this new place and reads her days away. Her hair grows freely, especially when she is stressed. Wrapped up in her world of literature, she wonders if she will ever have a first kiss or romance of her own. As her hair is growing more rapidly lately, she braids it and cuts it, making a rope, for what she is not yet sure. Wyatt, is sent to stay with his mother's best friend, Mrs. Greenwood, in the mountains where there is no cell reception and only small town life. He mistakenly wanders into her deceased daughter, Danielle's room and discovers her diary. Now with Wyatt narrating the story, we see how all of these characters come together. There is a disturbing drug problem in this small town and quite a few local teens like Danielle, have disappeared. When Rachel happens to spy and then save Wyatt from a frozen lake, the story becomes increasingly ominous. All three characters collide in the end with a remarkable outcome. This is a retelling of Rapunzel using a dark, Gothic mystery much like Wuthering Heights which is also one of Rachel's favorite reads. Although this one didn't grab me like Beastly and had no Kendra involvement, I really enjoy Flinn's writing and this story does work in the end. There are lots of interesting minor characters that add a unique small town flavor to the mix. Parents: this one has some kissing, mentions of drug use (in an evil light) and is pretty safe for teens. I am now looking forward to see what is next for this author. If you are considering purchasing this book or anything else from Amazon, please use my link above since I earn a very small percentage of the sale which helps pay for shipping my giveaways! I received this book from the publisher at no charge and in no way influenced my review. I saw EpicReads tweet the cover of this book a couple of weeks ago and fell in love with it! It's gorgeous! I loved Rapunzel growing up and loved Tangled. Who doesn't?! So glad to hear this is a great book. I can't wait to read it.